Stephanie Bryant suggested maybe a design-focused part of Games on Demand, where maybe some designers can get together and discuss, troubleshoot, etc. Maybe even get some game playtesting going. And hence was born Half-Baked Breakfast. I've learned to avoid Sunday morning as Bob and I found that we were the only ones showing up, however, here we're talking about some more serious motivation. Stephanie and a few showed up at 8:30am, and some of us a little bit later. I rolled down there about 8:45am. She'd already started a cool little thing by the name of lean coffee. Apparently this is "a structured, but agenda-less meeting. Participants gather, build an agenda, and begin talking. Conversations are directed and productive because the agenda for the meeting was democratically generated." Everyone generates questions, votes on one or more that they are interested in discussing, and a very simple but effective time-tracking system is in place to try and target as many topics as possible. It was pretty fascinating to see, looked very simple to produce and run, and appeared to create some solid results. This will become a staple of GoD's to come, and perhaps even scheduled in the con book! After the lean coffee was over, most people took off, but Chris had a copy of a short-form narrative 2-player game he'd put together, and Bob and I took it for a test-run with Chris' help facilitating. It's called I'm Afraid of You, and is about two characters in opposition: "One a monster that must be appeased. The other a victim who has what the monster wants." The mechanics are super simple card draws from a poker deck, and the success and failures are interpreted and the narrative just plows forward for as long as the players desire. I suggested a scenario that had to do with human colonists who've landed on a planet, and been mostly wiped out by the indigenous population. The monster was one of these local creatures, and the victim was a young boy who is the sole survivor and has been in the forest for about a month. Bob played the monster, and imagined them as sort of like Predator, but without the tech... a hunter type creature. The kid had what the monster wants: a homing beacon which would likely bring a rescue mission. From there we had taboo lands, little creature pets, and a dramatic showdown. The part which I loved about this game was that the scenes felt like they developed fluidly, and the feels just sort of crept up on you. It reminded me a little bit of playing Alex Roberts' Tension (which I wrote about somewhere here). 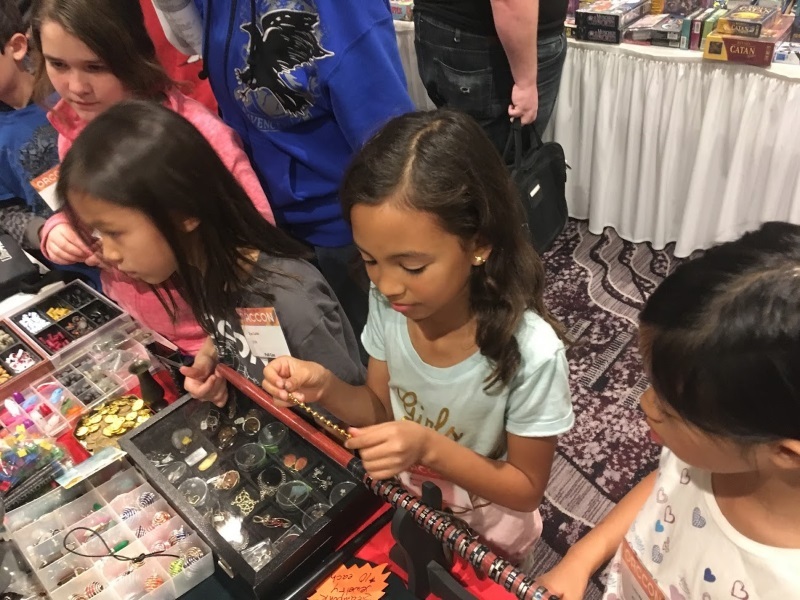 We did a little bit of miniature painting at the paint-and-take, and then hit the dealer room (another big draw). They're favorite spot is Michael Mirth's booth, which is set up as a sort of kiddie wonderland. After a little wandering around, I wanted to grab a bite from the room, and we had some time, so we took everyone up to the room (which is also next to the pool) for the kids to get out some of their vast amounts of energy. The jumping-all-over-the-beds game. Not in the convention book. There were about 11 kids. I had one or two GM's in the wings, but the games that sold were Goobles and Goblins which Ryan ran for 4 kids, and me running The Deep Forest for a group of 7. Ryan running Goobles and Goblins. These kids were excited by the game, every time I looked over! I was really looking forward to running The Deep Forest. It's a variant of The Quiet Year, which is one of my favorites of the GM-less variety: a map-making game that's very collaboratively driven, and great for newbies and experienced players alike. In the Deep Forest, you play a group of monsters who have reclaimed their territory from the invading humans. They have some time to rebuild, however the game ends when the humans come back (perhaps with dire consequences). The creativity of the kids was always great to behold. We had penguin warriors, and gaseous clouds with illusion power, an elf queen riding a griffon, a thingamabob, a strange caterpillar monster, and a little bunny so cute it could mesmerize humans into doing what it wanted. The game plays in seasons, each contains in a suit of cards. Because there were 7 players, I did one round of cards as one season, which was the perfect amount of time prior to taking a break. Normally each player gets a choice to answer 1 of 2 questions, but I simplified this to just asking them one of the questions. I stretched my kid-management skills, using moments to close our eyes to imagine things, or close our eyes to vote on how many weeks projects would take (to reduce peer pressure). The kids wanted to have the monsters win in the end of the game (after I told them it normally has a sad ending), and so I told them that if they played collaboratively by listening to each other and using each others ideas to build upon, then they could win. I made sure that there were fairly strict limits on their drawing area. This really helped ensure a level of fairness around the table. I think some of them appreciated that structure both as far as being able to set expectations for themselves, as well as ensure that others didn't get to draw more than them. Discovering new things was popular. Projects weren't very popular, but came up mostly through questions. In the second season some of the kids started getting interested in starting projects. At one point we had 3 going on the map at once. All in all, I felt it went very well, and importantly, I'd run it again in a heartbeat. But after 2.5 hours of gaming, I was exhausted. 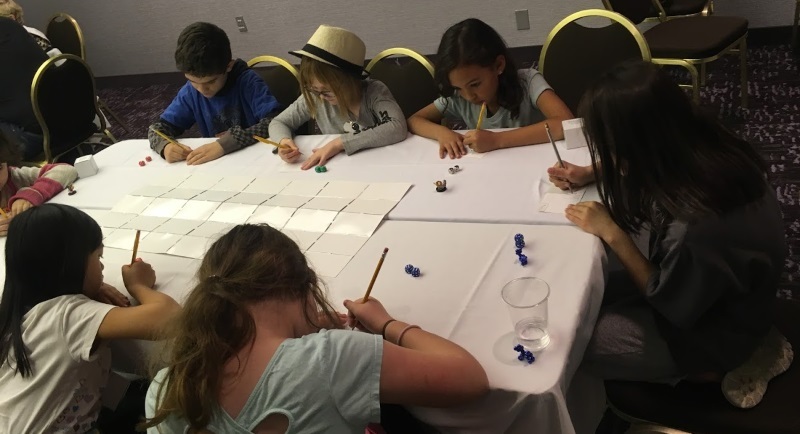 One of my favorite parts of the game... 7 kids drawing monsters, in silence. Nova's awesome penguin warrior, Tala. The Deep Forest crew with their map of caves and underground lakes, sunken ships, mysterious footprints, caches of weapons, berry bushes, and glowing rock formations. The next hours included some general hanging out. We spotted PST Improv doing their thing. Nova and I have checked them out before, and took many of the kids and families from Games on Demand to go have a view. The improv crew sources words and inspirations from the crowd, and our kids were happy to oblige them (especially with the word "cow", over and over again). We also hit the game library (where you can rent one of hundreds of games) and the Open Gaming area down in the lower lobby. I showed some of the kids how to play Lotus (which I picked up in the virtual flea market), and Ann-Marie played Catan Junior with a few of them. This is one of the big draws for the kids. We ended up being in the room full of teens. Apparently some werewolf aficionados aren't as into these games, as there is a reputation for using weird roles in the games (and the teens mostly act like teens, and when there is a lot of 'em... hoo boy). Of course some of the kids wanted to have another go, and so round 2 commenced, ending before 3am (so a fairly "quick" game). I could only take so much though, and left the kids with Jim and mostly hung out and chatted with various RPG friends. Oh, the lovely couple attempting to murder each other! Had access to the upstairs breakfast lounge, something Nova enjoys a lot, so we did breakfast before they shut down (barely). The rest of the con involved wandering around a bit, playing the "scavenger hunt game" during which we found a few dice around the convention floors, and the kids running around playing tag and such. At one point I showed Ann-Marie and family and daughter how to play Lotus. Lotus... such a pretty game. And with that, the con comes to a close... this time with possibly more regulars for next time!